Well, after all it is the rainy season... today was one of the wettest days of the year. No doubt about that. Started nice enough. I took the kids to school and got to work at Karon beach a little after 9am. Shortly after that, heavy rain started. And continued. And more. Well, good that I was not late for work! Get the idea? It was a wet day. A good day for going to Central Festival Mall.. which is probably where we'll go tomorrow if the weather is wet! Heavy rains since this morning have caused flooding at many locales around the island, causing long tailbacks along major roads and damage to shops inundated with water. 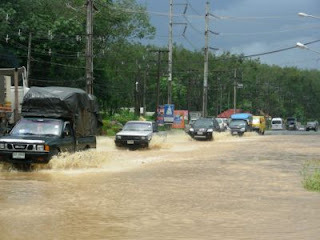 Only the true weather here on the Phuket Weather Blog!